Truck Driving Jobs - Dedicated - Avg. 62 CPM & $1,125+/wk Guaranteed! Truck Driving Jobs - Dry Van - Home Weekend Options + Average 58 CPM! Share your latest paystub and you can earn a 2 CPM raise two ways: 1. If your paycheck shows you to be a productive driver with your existing carrier, you’ll get a 2 CPM raise as soon as you start with Marten. 2. If you do not meet the production goals right away, you’ll have six weeks to meet them. Do so by the end of six weeks and you’ve earned your 2 CPM raise. INCREASED Incentive Bonus! •	$1,500 for first referred driver •	$2,000 for any additional drivers referred within a year of the first referral possible! Find Out Why It Is Better In Blue! Founded in 1946, Marten Transport has reached its high level of success by focusing on providing outstanding customer service and employing exceptional professionals. Marten Transport, Ltd. is a premier supplier of time and temperature sensitive transportation services to our customers. We are a full truckload, irregular route carrier providing service to all 48 states, Canada and Mexico. Marten Transport focuses on customers who require protective service, or have products, which are time sensitive in nature. Marten Transport challenges the "status quo" and provides the most cost effective alternatives that result in our customers gaining a competitive advantage in the markets they compete in. 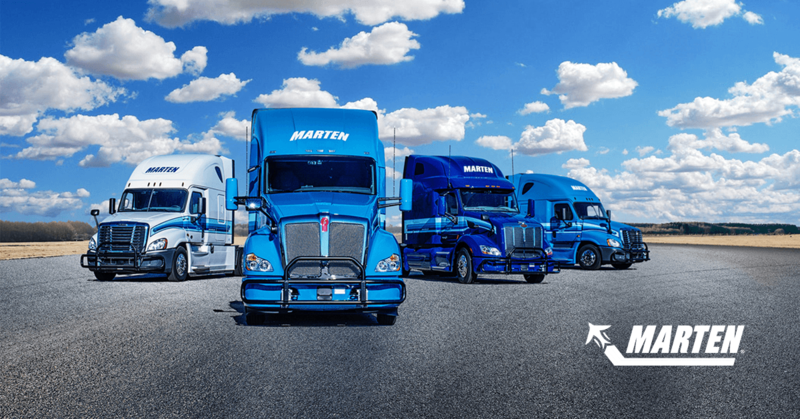 Over the last several years Marten Transport has transformed our business from a primarily long haul temperature control carrier to a multi-faceted temperature control carrier. We believe our drivers are the best in the industry. The integrity and professionalism they exhibit on a daily basis has earned us elite status among temperature protected freight haulers in North America. That's something we plan to continue. Marten Transport utilizes HireRight for driver employment and Contractor verifications.